Look at this kanji… isn’t it lovely? To your right you can see the word “certificate” brushed in Japanese calligraphy. It was kindly brushed for us by Eri Takase, internationally-renowned Master Calligrapher, and this kanji an example of the quality of the calligraphy that you will find on our Japanese Reiki certificate templates DVD-rom or download. We have prepared Japanese-style Reiki certificate templates so that they can be used by teachers from all Reiki lineages and styles, and we provide specially brushed kanji that represent all the different Reiki levels… and kanji suitable for many special “Reiki-related” courses too. Create your Reiki certificates from scratch using the images we provide: text, kanji and a special Reiki seal. All the Japanese Certificate Templates are available in A4 (210 x 297mm) size and also USA standard letter size (216 x 279mm) and so can be used in the UK, Europe and North America. The templates can be amended and adjusted to suit your needs: you can alter the wording, the font and the text size; you can change the text layout and design; you can move the special seal. These Japanese Reiki certificate templates are really special. They are unique. I think they are wonderful! When we commissioned Japanese Master Calligrapher Eri Takase to prepare the calligraphy for us, we discussed the wording of the certificates with her to make sure that it would be suitable for all varieties of Reiki, and we took Eri’s advice about the correct layout and components of the design so that the Reiki certificate templates reflected the traditional Japanese approach. To order your DVD-ROM you can use the payment buttons below. This item is GUARANTEED so if for any reason you are unhappy with it, return it to us for a full refund. Price: £35.98 + p&p, available WORLDWIDE. To download the Certificate templates onto your computer now, you can use the payment buttons below. This item is GUARANTEED so if for any reason you are unhappy with it, you will receive a full refund. 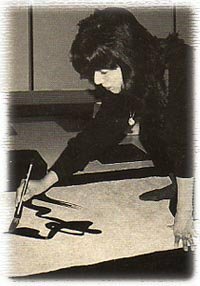 Born and raised in Osaka Japan, Ms. Takase trained in traditional Japanese calligraphy since the age of six, devoting much of her life to the art. In 1989, Master Takase was awarded the rank of Shihan (or Master) in Japan’s most prestigious calligraphic societies, the Bokuteki-kai and Bunka-shodo. Master Takase is among the few to have won several best of category awards in national competitions and her work has been displayed in the Osaka Museum of Arts. This strong background in the classic art is apparent in all she does. From traditional works to modern designs one sees both the hand of the master and the vision of the artist. In 1997 Master Takase founded her own school: Takase Shodokai. Here you can read further testimonials from people who have purchased our Japanese Reiki Certificate Templates on DVD-ROM.